The tiny workshop is encased in the body of a real violin. Scale is 1:12 so that hanging violins are only two inches long. The cello is probably four inches as a real cello is 48 inches but the museum recording didn’t say. Tracy made little tool replicas to hang on the back wall. 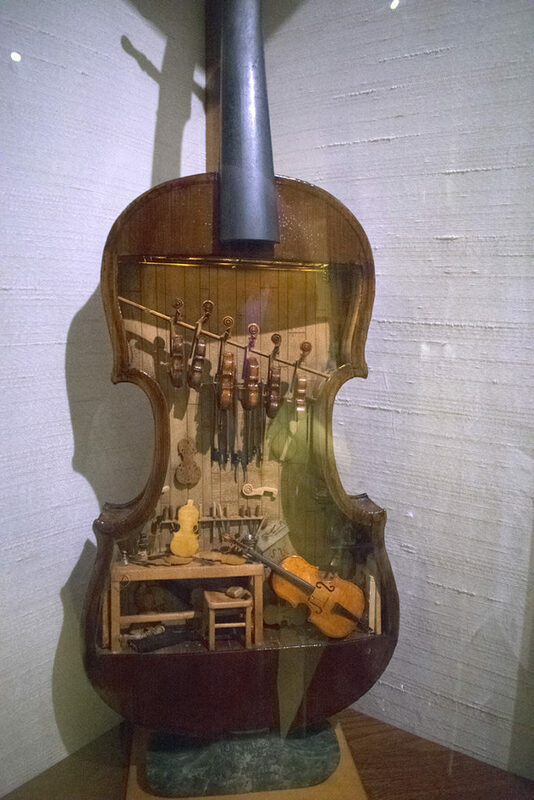 The real violin’s body is only 2 inches deep and was cut away to hold the scene. Wow! Truely amazing and so clever! Indeed, that is really amazing! I thought so too! Thanks for visiting Brian! Wow, this is brilliant. Such workmanship. Wow. I agree it’s amazing. They are so tiny. He didn’t have to create the shop inside a real violin, but that is the genius part. I totally agree it was genius that he put the tiny shop inside a real violin. amazing! It would be interesting to see.a sense of scale. Maybe throw an empty cigarette pack into the scene or something. I know its smaller than I think it appears, since its built out of a violin, but I’m being fooled by the concept. You cant fit all that stuff in a real violin! lol, you’re going to get me arrested! laughing, you two are so cute and funny! I was there at the Tucson Museum, but I don’t remember seeing this gem. darn. Oh I remember seeing something about that. If I make back there, I’ll check it out. Thanks.